An inspiring children’s book about an albino hedgehog who overcomes prejudice has been brought to life thanks to the help of Teesside University’s digital studio. Animation graduates from the studio worked with author Peter Barron and illustrator Jonathan Raiseborough to create a series of animations of ‘Snowdrop the Spikeshuffler’ that will help spread the book’s positive messages about not judging people because they are different. Snowdrop the Spikeshuffler has been published nationally with the support of the North East Autism Society and the animations will be used as part of an educational programme by the charity to help inform young people about autism. The animations, done by graduates Stephanie Hodges and Johnny Stafford, were formally launched at a special assembly at Firthmoor Primary School in Darlington where pupils also held a sponsored ‘Bad Hair Day’ in order to raise money for the North East Autism Society. Peter said: 'Having written the book and seeing it illustrated, the next stage was to make the characters move. 'Teesside University has a fantastic reputation for animation so it made sense to go there for assistance. Jonathan, who has Asperger’s Syndrome and is a former pupil of Firthmoor School, said he was delighted at the results of the animation. The results have been brilliant and the animations have really caught the spirit of the book – they really bring the story to life when we speak to children about it. Johnny said: 'This was an extremely interesting project and we’ve enjoyed working on it. Teesside University’s digital studio helps steer graduates into professional careers by working with external clients to collaborate on live projects and gain workplace experience. Siobhan Fenton, Associate Dean (Enterprise & Business Engagement) in Teesside University’s School of Computing, Media and the Arts, said: 'We are delighted that the Digital Studio has been able to help Peter and Jonathan add a new dimension to the tale of Snowdrop the Spikeshuffler. John Phillipson, chief executive officer of the North East Autism Society, said: 'From the outset we were captivated by the idea of Snowdrop. 'The concept of celebrating and accepting difference was then brought to life by the incredible illustrations from Jonathan. 'To now see them animated further clarifies what we already knew – that Jonathan is a success in his own right - because when you are truly as gifted as he is, others will see it, join in and celebrate it too. 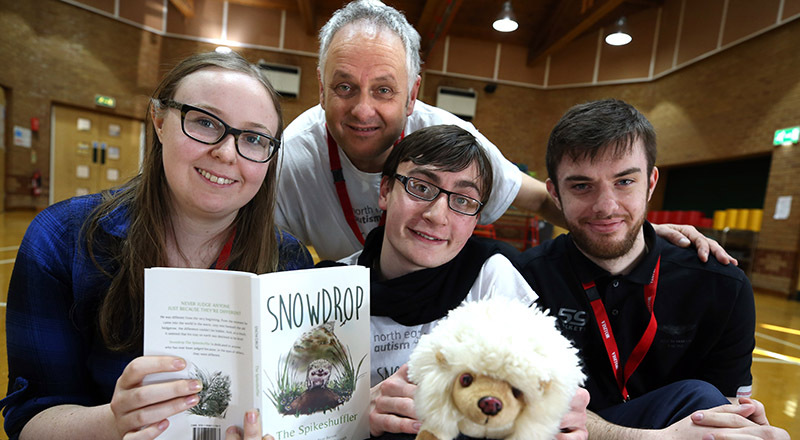 Inspiring children's book, Snowdrop the Spikeshuffler, has been brought to life thanks to the help of Teesside University's digital studio.